Shanghai Pudong International Airport, a major aviation hub of China, is your gateway to one of the most glamorous cities in the world. 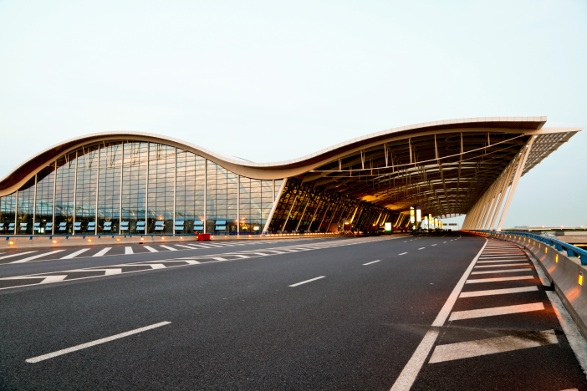 With an annual capacity of 80 million passengers, Shanghai Pudong International Airport is the fifth-busiest airport in Asia and the ninth-busiest in the world. Currently, the airport hosts about 104 airlines serving more than 210 destinations. Shanghai Pudong International Airport (IATA code: PVG) is a key airport for international arrivals and departures, and the main hub for China Eastern Airlines, Shanghai Airlines, and Air China. Flights to Shanghai Pudong International Airport are provided by international airlines such as Lufthansa, Air France, and KLM. PVG is a 45-minute drive from the centre of Shanghai. Book your cheap flights to and from Shanghai Pudong International Airport online! Shanghai Pudong International Airport is one of two main international airports in Shanghai. The airport occupies 40 square metres along the eastern coastline of Pudong. Since construction began in 1997, Shanghai Pudong International Airport has remained in a state of ongoing expansion, making it a fast-growing hub for both passenger and cargo traffic. Its four operational runways, two terminal buildings, and wide network of ground transportation allow an annual capacity of over 80 million passengers. With over half of its annual passenger traffic arriving from international destinations, Shanghai Pudong International Airport is the busiest international hub of China. Whether you want to indulge in local and international cuisine, or simply want to have a drink while waiting for your flight, Shanghai Pudong International Airport offers a number of restaurants, fast food outlets, coffee shops, and bars. The shops at Shanghai Pudong International Airport range from gift retailers and newsagents to designer brand boutiques and duty-free outlets. Duty-free shopping is available in the domestic and international departures area. Please be aware of baggage restrictions and duty-free allowances at your destination. Shanghai Pudong International Airport has several lounges in the domestic and international departures terminals. Each offer a selection of services and facilities to ensure a comfortable journey. The services at Shanghai Pudong International Airport include: banking and foreign exchange, information desks, special assistance, hotline, and luggage storage. The facilities at Shanghai Pudong International Airport include: ATMs, business centre, luggage lockers, post office, charging stations, photo booth, telephones, vending machines, medical centres, showers, internet kiosks, and Wi-Fi. This no-frills 2.5-star hotel is an easy 15-minute drive from Shanghai Pudong International Airport. Amenities include a front desk safe, tour/ticket assistance, airport shuttle bus, and air conditioning. Complimentary Wi-Fi is available. This stylish hotel is a 20-minute drive from Shanghai Pudong International Airport. Some of its amenities include a restaurant, business centre, laundry service, housekeeping, concierge services, and airport shuttle bus. Complimentary Wi-Fi and parking is available. This elegant hotel is located just 5 minutes from Shanghai Pudong International Airport. Amenities include a fitness centre, restaurants, business centre, garden, arcade room, limo/town car service, airport shuttle bus, and air conditioning. Free Wi-Fi and parking is available. Foreign currency can be purchased at the airport or at an exchange bureau up to 60 days before departure from South Africa. There are foreign exchange counters in both the arrival and departure hall at Shanghai Pudong International Airport. Shanghai Pudong International Airport has a small outdoor car park and multi-storey facility with over 3,000 parking spaces. Short and long-term options are available in both parking facilities. Dedicated parking bays for disabled passengers are also available. Shanghai Pudong International Airport is located in Pudong New District, approximately 30 km east of the Shanghai city centre. A multitude of transport options are available to get you to your destination. Some of these include: Car hire, metered taxis, metro, buses, shuttle bus, Uber, and the Maglev high-speed train.